In 4-quart pan, cook oysters with liquor, over low heat until edges of oysters just begin to curl. Add milk, butter, salt and pepper. Heat slowly until hot; do not boil. (For extra zip, sprinkle seafood seasoning on each serving. Makes about 6 cups stew. Sift half of flour with salt and dash of garlic salt into mixing bowl. With wooden spoon, stir in butter and egg. Pour in beer gradually and mix only until batter is fairly smooth. Do not over mix. Let batter rest at room temperature 1 hour. When ready to fry oysters, beat egg white well until stiff enough to form peaks. Gently fold egg white into batter until no streaks of white remain. In deep fryer, heat oil to 375 degrees. Oil should be at least 3 inches deep. Dip oysters in remaining flour, shake off excess and dip into batter. Let excess batter drain off. Fry oysters 5 or 6 at a time for 3 to 4 minutes or until puffed and golden. Drain on paper towels and keep warm in 200 degree oven until all are fried. Serve immediately with lemon wedges. Put parsley, onions, spinach through food processor until finely chopped into a paste. Sprinkle Tabasco sauce on; then mix in bread crumbs, butter and seasoning. Mix well (may be made in advance and frozen or refrigerated). Return to room temperature for serving. 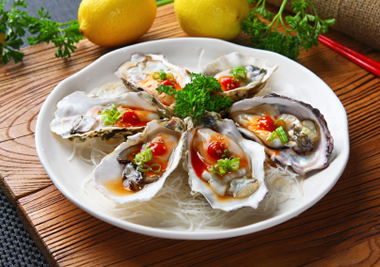 Open all oysters and use a sharp knife to loosen muscle. Place an oyster from the pint on each shell top. (Doubling the number of oysters). Pour the rock salt on a rimmed cookie sheet (this provides a stable surface for the shells). Place shells on the salt. Put about 1 tablespoon of spinach mixture on each oyster. Bake at 450 degrees for 5-8 minutes, or until heated all the way through. Serve with small forks. Shells may be washed and reused. 1. Light charcoal grill. 2. In a bowl, mix panko, olive oil, lemon juice, prepared dressing mix, fennel tops and bulbs, and bacon in a bowl and set aside. 3. Drizzle each oyster with teaspoon of bottled dressing. Grill oysters over medium coals, shell side down, for about 1 minutes. Top each oyster with about a teaspoon of remaining bottled dressing and pack with bread crumb mixture. Top each oyster with cheddar cheese, sprinkle with parmesan and place back on grill. Cover and grill for another 5 minutes or until cheese melts and bread crumb mixture is lightly browned.